Ubuntu 11.04 Natty Narwhal has been a revelation of sorts in terms of UI improvements it brought to the table. 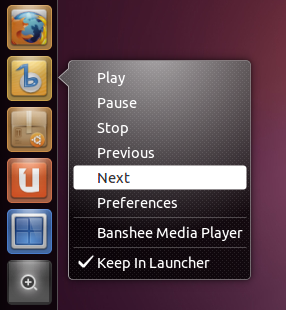 One of the highlights of the new Unity UI is the launcher that sits on the left side of Ubuntu 11.04 Unity desktop. Now I can access my most favorite apps much more faster and my desktop will remain clean at the same time. 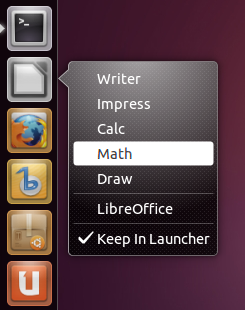 But I didn't noticed the limitations of Unity launcher until I implemented the following quicklists which further enhanced the Ubuntu Unity launcher functionality. I am pretty darn sure that you are also going to love these awesome Unity launcher improvements as I did. Copy 'Home Folder' launcher file to your home directory. For that, you need to open Terminal(Unity Shortcut: Ctrl + Alt + T) and copy-paste the following commands. Open the file in your favorite text editor. I am using Gedit here. Now replace the content of the file with the following text. And restart Unity. Hit Alt + F2 and run the following command to restart Unity. Done. If that doesn't work, you might need to log out and log back in to restart Unity. Theme I was using in the screenshot - Equinox GTK Theme + Faenza icon theme. 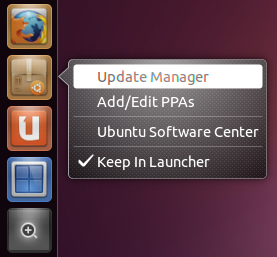 As before, copy Ubuntu Software Center launcher file to your home directory. Open Terminal and copy-paste the following commands. Open and edit the file using Gedit. And simply copy-paste the following lines towards the bottom of the file(after the line X-Ubuntu-Gettext-Domain=software-center to be precise). Done. If that doesn't work, you might need to log out and log back in to restart Unity. Copy Banshee launcher file to your home directory. And simply copy-paste the following lines towards the bottom of the file. Copy Chromium Browser launcher file to your home directory. Done. If that doesn't work, you might need to log out and log back in to restart Unity. Though it worked fine, "New Incongnito Window" option was not visible for me. Don't know the reason, a browser restart might do the trick. Copy GNOME-Terminal launcher file to your home directory. Find(Ctrl + f) the following line from the file. Replace it with the following line. Now, simply copy-paste the following lines towards the bottom of the file. 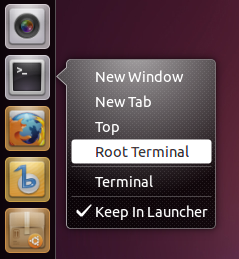 Close all Terminal windows, right-click on Terminal launcher icon and untick 'Keep In Launcher' option. Finally, browse to the ~/.local/share/applications/ from Nautilus file browser and simply drag and drop the new Terminal launcher(file name: gnome-terminal.desktop) onto the Unity Launcher. Done. Copy LibreOffice launcher file to your home directory. As with the case of Terminal launcher, navigate to ~/.local/share/applications from Nautilus and drag and drop the LibreOffice desktop file(libreoffice-startcenter.desktop) into the launcher. You can find more such quicklists for a range of applications such as Firefox, DeadBeef, Google Docs, Google Chrome etc. at askubuntu, which is also the source of this article. 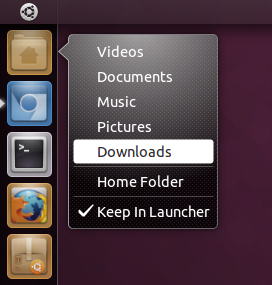 I think, at least some of them, like the "Home Icon" quicklist, should come as default in future Ubuntu releases. They are proving to be a real time saver for me. Meanwhile, you might also want to check out our collection of things to do after installing Ubuntu 11.04 Natty Narwhal and top 10 Ubuntu 11.04 powered Laptops and Netbooks as well.